With the recent down turn in the cryptocurrency markets and more specifically the DASH market. 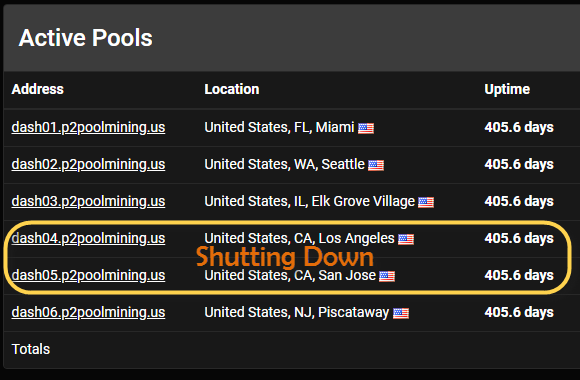 The P2PoolMining team has decided to consolidate the West Coast P2Pool nodes. Effective January 11th, 2019, we will consolidate the 3 West Coast nodes into one single P2Pool-Dash node based out of Seattle. The above nodes will be consolidated into our DASH02 – Seattle, Wa. Node. The consolidation will happen on January 11, 2019. Therefore, if you are currently mining on either of the two affected nodes please make plans now to reconfigure your miners to our Seattle (DASH02) node. We'd like to take this time to thank the miners who have mined via these two nodes in the past. Without your support we would not be able to operate. In the future, when the markets for DASH turn around, we may revitalize these two DASH P2pool nodes.